what does v8 do with that loop? And indeed, with my selfish Guile hat on, this study in V8 is giving me lots of ideas and motivation. So perhaps V8's new motto should be, "shaming the world into faster code, one compiler at a time". The boxes represent the flow of data in the compilation process. There's only two boxes because, as we said, it's a simple compiler. All local variables are stored either on the stack or on the heap, not in registers. Any variable referenced by a nested function is stored on the heap, in the context object associated with the function in which the variable was defined. The compiler will emit loads and stores to pull these values into registers to actually do the work. The top of the stack of temporaries is cached in a register. Complicated cases are handled by emitting calls to runtime procedures. The compiler does track the context in which an expression is being evaluated, so that tests can just jump directly to the consequent blocks, instead of pushing a value, testing if it's zero or not, then branching. Small integer arithmetic is usually inlined. And that's all there is! Actually I should mention one important optimization that is done even with the full-codegen compiler, and that is inline caching. See the Hölzle, Chambers, and Ungar paper I link to there for all of the details. Inline caches are used for assignments, unary and binary operations, function calls, property accesses, and comparisons. The inline caches also serve as sources of type information, used by the optimizing compiler. In the case of some statement types, like assignments, the only purpose of the IC is to record type information.Ed. : see the comments for a correction. 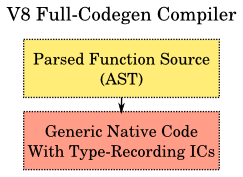 The full-codegen compiler. Most of the meat of the full-codegen compiler is in the target-specific directory (4257 lines vs 769+1323 lines). Currently supported targets are ia32, x64, arm, and mips. The first time V8 sees a function, it parses it to the AST but doesn't actually do anything with it. It only runs the full-codegen compiler when the function is first run. How's that for lazy! But after things have started up, it kicks off a profiler thread to see how things are going, and what functions are hot. This lazy, sit-back-and-watch approach gives V8 time to record the type information flowing through it. So by the time it has decided that a function is hot, and could use a little more help, it has type information to give to the compiler. Everytime an IC stub sees a new kind of value, it computes the type of that value, and bitwise-ands it with the old type. The initial type value is uninitialized. So if an IC only sees integers in the Smi (small integer) range, the recorded type will indicate that. But as soon as it sees a double value, the type becomes Number; and if it then sees an object, the type becomes Unknown. A non-primitive IC will necessarily store the map of the receiver type in the IC, for dispatch purposes. Type feedback can parse the IC stub to get at this map, when needed. Ed. : more corrections. Thanks, Vyacheslav. Type feedback information is associated with a particular AST node (the assignment, property load, etc.). An integer identifier for the node is serialized into the IC so that when V8 decides that a function is hot, it can parse out the recorded type information from the full-codegen code, and associate it with the AST node. Now, this process is a bit complicated. It needs support up and down in your compiler stack. You need to have inline caches. Your inline caches need to have support for the type information, both for operands and for the result. You need to be able to walk this data to find the values. Then you need to link it back to the AST, so that when you pass the AST to your optimizing compiler, the compiler is able to ask the right questions. The concrete strategy that V8 takes is to parse the data into a TypeFeedbackOracle object, associating information with particular AST nodes. Then V8 visits all of the AST nodes with this oracle, and the nodes themselves parse out the data that they might find useful from the oracle. In the end one is able to, for example, ask a Property node if it is monomorphic, and in any case what are the receiver types at that node. It seems that this works well for V8, because it reduces the number of moving parts in the optimizing compiler, given that it doesn't need to have the TypeFeedbackOracle itself. The TypeInfo 8-bit data type, and the TypeFeedbackOracle declaration. I have to admit, I really like the use of C++ within V8. It's a nasty tool, but they wield it well. The implementation of TypeFeedbackOracle. See ProcessTarget down at the bottom of the file for where the bulk of the work happens. Also check the ast.h link before to see see how type feedback ties into the AST itself. Once V8 has identified that a function is hot and has collected some type feedback information, it tries to run the augmented AST through an optimizing compiler. This optimizing compiler is called Crankshaft in the marketing materials, though that name rarely appears in the source itself. First, a high-level intermediate representation (HIR) of the compiled method is built via an abstract interpretation of the bytecodes. It consists of a control-flow graph (CFG), whose basic blocks are singly linked lists of instructions. The HIR is in static single- assignment (SSA) form, which means that for every variable there is just a single point in the program where a value is assigned to it. An instruction that loads or computes a value represents both the operation and its result, so that operands can be represented as pointers to previous instructions. Both during and after generation of the HIR, several optimizations are performed, such as constant folding, value numbering, method inlining, and null check elimination. They benefit from the simple structure of the HIR and the SSA form. The back end of the compiler translates the optimized HIR into a low-level intermediate representation (LIR). The LIR is conceptually similar to machine code, but still mostly platform-independent. In contrast to HIR instructions, LIR operations operate on virtual registers instead of references to previous instructions. The LIR facilitates various low-level optimizations and is the input for the linear scan register allocator, which maps virtual registers to physical ones. This statement describes Crankshaft very neatly, and the rest of section 2 of that paper applies in a general sense. Of course there are some differences. Crankshaft starts with the AST, not bytecodes. The HotSpot client runtime does not use type-feedback to help its compiler, as it is less necessary for Java, though it would still be helpful. Crankshaft doesn't do very much with exception handlers. But the similarities are such that V8 can actually produce traces that can be read by c1visualizer (docs), a program used to visualize the internals of the HotSpot client compiler. (The client compiler appears to be known internally as c1; the server compiler appears to be opto). This post is getting quite long. I'm going to have to send my mom some flowers or something, because I'm sure she does check these things out, and it must be brain-numbing to slog through. Another paragraph? When will he stop? So if you, dear reader, find yourself in this category, you're in good company, because my mom is a lovely lady. But if you're a compiler geek, I think I have at least couple more articles to write on Crankshaft before I can get back to other hacks. 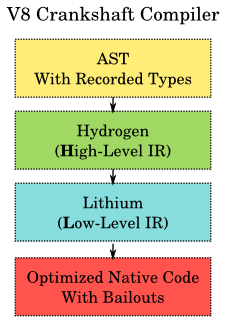 Specifically, we'll go into the optimizations that Crankshaft does on the Hydrogen IR, and take a look on how it does the translation to Lithium. But until then, happy hacking! Note that SSA form is equivalent to our good old CPS form, by way of ANF form. Funny how the rest of the compiler community took decades to get to where Scheme was in 1975. Bit 7 is the number (of any size or type) bit. If all 7 bits are set, that's the uninitialized value, which must be asserted away before the bits can be examined. I wonder how the types of true, false, null, and undefined are represented. V8 reparses function every time it needs to compile the function with full or optimizing codegen. > In the case of some statement types, like assignments, the only purpose of the IC is to record type information. V8 does not emit IC unless there is something to resolve and cache. Trivial assignments to variables do not have ICs. Only keyed stores and property stores get ICs. > Everytime an IC stub sees a new kind of value, it computes the > type of that value, and bitwise-ands it with the old type. The > initial type value is uninitialized. Well. That's not entirely correct description of what happens. ICs just transition between states (e.g. get patched with different code stubs) during execution just like a FSMs. TypeInfo is not stored in the IC itself, but Oracle knows how to convert state of the ICs into TypeInfo structure. TypeInfo::Combine afaik is dead code and is not called from anywhere. Thank you again, Vyacheslav, for the insight (and patience with my ignorance). I'll see what I can do to correct the most egregious of the errors. John, the feedback bits aren't the same as the tag bits. V8 represents small integers and failures as immediates, and everything else is a heap object with a first map word. See objects.h for the full hierarchy. The HotSpot Server VM is known as c2. > The HotSpot client runtime does not use type-feedback to help its compiler, as it is less necessary for Java ..
No, HotSpot client and server use type-feedback otherwise your are not able to inline which is the mother of all other optimizations. But because Java bytecode is typed, you only need type-feedback for instanceof, cast and virtual call. Hotspot also profiles nullcheck, and count branch used. There are 3 modes (in fact more because the strategies are pluggable), in client mode, the interpreter does the profiling and c1 generate the code using the profiled information, in server mode, same thing but interpreter + c2 and in tiered mode, the interpreter does some profiling, c1 is trigger but also generate code + profile and then c2 is triggered. Also IBM J9 or Oracle JRockit have no interpreter and use the same two compilers implementations. What's up with this HIR/LIR split? Why would i want to do that? I understand that there is a point in the compiler, where some kind of lowering happens, which is usually, where we draw the line between middle- and backend. However, the difference of references vs virtual-registers is not an essential or important fact. The the middle end could use virtual registers (e.g. LLVM) and the backend could use direct references (e.g. libFirm). What exactly happens during the HIR->LIR transformation and why? Manu's jalapeno reference does not mention this. Thanks for stopping by, Rémi. I am quite ignorant about the JVM world, to my discredit; thanks for the notes. In particular I was unaware of the tiered mode, and of the situation in non-HotSpot JVM implementations. Manu, I did not mean to claim that the three-stage compiler idea comes from HotSpot, though I can see how you would read that; indeed even Guile (poor compiler though it is) has what used to be called GHIL and GLIL intermediate languages, originating back around 2000. What I do suggest is that V8 has a particular debt to C1 from OpenJDK 6.
bza1e1, I wonder about that too. I have a bit of research to finish before writing about that, but it is next on the list. I remember back in the day when there used to be the occasional left wing diatribe mixed in with all the hack talk. With end times almost on us I was hoping to find more of a focus on THINGS THAT MATTER. Excellent post. Looking forward to reading more. Full our impressive selection of free studies, drawing e-newsletter signups, downloads and also various other deals.xbox live gratuit Given that the launch of the Xbox collection, adjustments are unpreventable, hence making gamers experience an extra better pc gaming experience yearly. It is not viable to have tens of hundreds of tokens right into one single account. It is not yet best, we are still dealing with our hacking servers and in some cases it could not deliver in full 1000 free tokens. Get this best online tracking services to go on us our website.